Jeffrey Zeldman on why he’s getting back into hands-on design, what building (many) businesses has been like, and why every young designer should work in a studio at some point. A couple of months ago I had the honour of interviewing Jeffrey Zeldman for our podcast series. Unfortunately the quality of the audio recording was less than ideal, so I decided to transcribe some of our chat here rather than put out a sub-quality podcast. In addition to being dubbed the King of Web Standards, Jeffrey is also the Founder of Happy Cog, founder of A List Apart, co-founder of A Book Apart and An Event Apart, and host of The Big Web Show podcast. Here is a lightly-edited version of our conversation. Alex Nemeroff: You’re in New York right? Jeffrey Zeldman: I am, it’s a little chilly here today. AN: It is here too. Usually like when I’m speaking to the people in the States, I’m the one complaining of bad weather, but it sounds like you and I kind of have the same thing right now. JZ: I love that city so much. AN: Have you been here? JZ: Yes — I have a cousin Susan, and when I was growing up we used to visit her twice a year. We lived in New York, and later Connecticut, and would drive up. This is when dads would pack you in the car, and drive, and get really mad… that was awful. AN: That’s the part of my life that I’m entering right now. I have two young kids, and I’m about to get to that “mad driving dad” phase. JZ: Be good to your kids. AN: Man I’m going to try so hard, I’m going to try so hard. JZ: It’s so boring for the kids back in the back seat. So if you’re in Montreal where do you drive to? AN: I drive down to where you are. JZ: Yeah, my cousins did too, but we used to visit Montreal around Christmas time. AN: So you were here winter or summer, or both? JZ: Winter. That’s what I remember, we did both, I think we went to these mountains, the Laurentians in the summer. But in the winter we would go right to Montreal, where the snow was taller than my head. AN: Usually when people say, “I’m going to come to Montreal,” I say, “Great come in the summer, unless you want to ski.” So, do you ski in New York? JZ: No, I almost killed someone the one time I tried, so no. AN: You haven’t been to Montreal in a while then? JZ: No I really want to come, I haven’t been in years. AN: We’re trying to build up this range of talks — Dynamic/MTL about the stuff that we learned at An Event Apart. So it’s in our vision map to have An Event Apart here one day. JZ: I would love to do it, but I don’t know about the logistics. Although Canada is easier than Europe. Europeans often say, “Why don’t you bring in An Event Apart to Europe?” And then there’s the complexity of that. Not to get good speakers and put them on the stage, that part is the same everywhere, but the financials, and taxation… I feel like we who work on the Internet are ahead of our countries, we have friends all over the world. We don’t think quite as nationalistically as countries do for the most part. For example, when I go to some other country to speak, and they’re like, “Why are you coming, are you taking away a job that someone from this country could be doing?” and I’m like, “No I’m just going to talk for an hour”. I’ve been held up at the border in friendly countries. I feel like we who work on the Internet are ahead of our countries, we have friends all over the world. AN: I know, Canada and United States, they purport to be very friendly, but it’s quite a fuss they put up when you’re just trying to go there for a day. Most of our work is in the States, so we face the same thing all the time. AN: I’m happy this is taking a political turn, that’s where I was hoping to go with this. The reasons that people follow you are the reasons that I, like anyone else in our industry, have been following you for a long time. You’re not only ubiquitous and smart, and have been very forward thinking on many things, but you also let people into your life. Even when you’re talking about your family. I’ve read countless tweets, insights, posts or even anecdotes on podcasts about your life with kids. JZ: That’s kind of perverted, you mean about my ex-wife and daughter? JZ: In this hypothetical situation, like on an airplane sitting next to somebody, I’m not going to hit them up for business or anything, and I’m not trying to make deep lasting friends. I’ll probably say I’m a designer. AN: It’s funny, when I think designer, I picture someone actually designing. But when I think of you, I think you must be three levels past that, much more into the big picture. JZ: Yeah, that’s actually been a problem for me; I want to get back into the hands-on. AN: Tell me about that, what do you miss? JZ: Everything. The thing is, the longer you do strategic work and supervise the design work, you can start to feel like a fraud. Web design is changing so much. Although the basics of design and communication don’t change, it’s become so much more complex. If I have a suggestion for how to develop something, people working for me giggle, like, “that’s nice grandpa.” I’m feeling like I’m losing those skills a bit. The biggest thing I’m doing this year is designing again. The thing is, the longer you do strategic work and supervise the design work, you can start to feel like a fraud. AN: This is touching on something very personal to me. We started our design firm Dynamo in 2000, and since then we’ve launched this small events series Dynamic/MTL, which is how we got in touch with you. Most of my time is spent thinking at the studio design services level. I’m surprised to hear that you want to get back in. I think that’s awesome, and it also makes me think that maybe you’re more connected to the state of digital services than I had anticipated. How in touch are you with the art of the industry — selling the services, actually strategically managing that work? JZ: I’m doing it again, and it’s something I haven’t done for the past few years because Greg Hoy and Joe Rinaldi and other folks at Happy Cog are really talented, and there stopped being a need for me to sell. When I started my studio first it was just me, and then it was freelancers for quite a while. Then we began to have people on payroll and everything else all that comes with that. What I found when I was working with freelancers was that, I work best when I hire people who get things done when they said they will, and who are really passionate about their work. I didn’t have to manage them at all. When you have to manage people who are talented, but not necessarily focused on things like deadlines, it’s never as good. I wouldn’t want to get in that situation again. JZ: Exactly. The whole purpose of starting things so that the magazine can run without me, the agency can run without me. JZ: Absolutely. Letting go of the need to control everything was wonderful. But having someone else design my company’s website… that was hard. AN: Is that an identity crisis? JZ: No, now it’s happened several times, but you get to a place where they sort of wheel you in like Captain Christopher Pike, and you give two beeps or one beep. I became uncomfortable with that, I felt too detached from the process. So now I’m back in the saddle. It feels great. AN: I feel like running a digital design firm, especially in the last few years, there’s so much talk about the role that design agencies play, especially as startups are either acquiring firms or acquiring talent. What is the future of the design firms? I think the same thing is happening with studios now. For a while there weren’t enough good design studios that understood the web, and digital, and multi-device. If you were a halfway good, and you got it, and you could talk it through with clients and explain it to them, then you had lots of business, and were turning away business. Now what’s happening is that we’ve done such a good job of sharing and explaining, such a good job of selling the importance of design, that a lot of our clients are now building their design practices. Some will be successful, some won’t. It depends if they allow their design practice to find its own way, or if they impose the same kind of top-down approach that they have with other divisions in their company. If they impose that top-down stuff, then they’re going to get a lot of talented people who are frustrated and can’t actually bring design into the enterprise. Assuming it goes well on the other hand, there will be plenty of companies that can do the basic things. But beyond that, they are still going to have special needs, anything from accessibility to, “My gosh this watch just came out, we’re not up to speed, we just need somebody who really gets this stuff”. When you have your conversations internally, what are you talking about? AN: I say there’s always a future for people who do good work. The idea of differentiation goes a lot of ways. Either that means you specialize, or you elevate what you’re doing. I think it’s always possible to elevate what you’re doing. There will always be a demand for people who do the best work in the industry. AN: That’s one of the things I’ve loved about An Event Apart. You get this feel for what used to be a very generalist category, but now there are many opportunities in a lot of different areas. But you don’t feel like you need to necessarily cover everything, you can dive deep here, or get someone who’s really an expert in this one specific domain, it’s been pretty cool. JZ: When Eric and I started An Event Apart, our goal was to make a one-track conference, because that was either unheard of, or almost unheard of at the time. We loved the conferences that we were going to, but we felt that people were kind of specializing out — “it’s time for me to go to the developer track now, or the design track, the content track, the marketing track”. That was one of the problems in the industry, people were working in silos. There were project managers meeting with clients, and agreeing to all kind of things without talking to designers, web developers, or UX people. Still goes on, of course, at too many companies. It’s something a conference like ours is designed to help fight by encouraging overlap and collaboration. Even if you’re primarily a developer, you’re not going to go, “Man this person is talking about type, why do I care?” You do care, because the product that you’re creating is rendered in type, so you care very much. We also wanted to create a conference that we would actually want to attend. It had to be high level in all of these other areas. Our theory was, if you’re mainly a designer, you can also listen to some high-level developer stuff. Even if you’re not going to go do it, to go back to your studio and implement responsive images, you can still follow Jason Grigsby when he’s talking about that. Or even if you’re not responsible for optimizing what’s happening on the server, you can listen to someone like Lara Hogan, and then everyone there will have the same experience. The smart people in the business (and there’s a lot of them) want to know how it all fits together, they want to understand it. Even if you’re primarily a developer, you’re not going to go, “Man this person is talking about type, why do I care.” You do care, because the product that you’re creating is rendered in type, so you care very much. AN: It’s a very cool achievement. JZ: Thank you, I really appreciate that. The goal is, then you go back to work with those people that you came with, and now you have a better understanding of the developer (or whatever the other folks’ disciplines are). I love that you send people from different disciplines, that’s great. AN: How do you decide what to do next, now that you’re getting back into design? Is there a process there, or is it more a question of following your interests? JZ: That’s a great question, it’s complicated. There’s business behind it too, you don’t have a ton of time. I’m getting more into editorial on A List Apart, more into design with Happy Cog, because I felt like I sat those dances out for a while. My favorite talks at An Event Apart are all strategic. Although as someone who’s been doing strategy for the last couple of years, I also feel a need to get my hands back in. With A List Apart, I love what we’ve achieved with the magazine, the broadening across many important topic areas, but in terms of editorial focus I’d like to get back to that front-end sweet spot again, because I think that’s where we can be great. I feel like I need to be involved heavily in acquisitions and talking to authors to make that happen, at least to start that process, and then it will perpetuate again. That’s what I’ve been doing, in partnership with managing editor Mica McPheeters, and it seems to be working for us. AN: A last question for you. With young designers coming into the industry and attending An Event Apart, what kind of advice to you give them with respect to choosing to work in an agency, a startup, big company design or freelancing? JZ: I teach a class at the School of Visual Arts every other semester here in New York, and the class is about that very thing. The folks who take the class are getting their MFA in Interaction Design, and they’re nearly done, they’re about to walk out the door. I’m like Alfred dusting off Batman’s shoulders, before he goes to fight crime. They’re on their way out the door, and they’re going to get offers. They may have ideas. There’s a class by Gary Chou where they basically have to make a product, and have to at least earn $1,000 from it. Some of the students want to do their own thing and follow their product vision, others want to work for NGOs and fix the world, they’re idealists. They’re all going to walk out that door from the School of Visual Arts, and immediately get offers from Facebook, and Twitter, and conferences. Maybe those are the right offers, maybe that’s what they want, or maybe it’s not. In the class we talk to people who work in different aspects of design, and talk about the politics — what it’s like in a big place or in a small place, how the teams work, their own personal stories, where they’ve been happiest. I try to find people who’ve worked in more than one of these slots. I’ve worked at a startup, and at a big agency, so I can contrast these two experiences. There’s a difference between designers and developers who are super social, vs. ones that are more introspective and private. I mean I like people, I like parties and stuff, but I also really need to chill and just be alone. There are certain kinds of jobs where you’re going to have to be very social in order to succeed, and other jobs where you’re just going to be evaluated on you work. It’s important to know those things going in. It depends on the person. I have a column called ‘Ask Doctor Web’ at A List Apart, where I wrote some articles about different people and the places they ended up working. I’m going to be writing more of that stuff. That’s one way to figure it out. Working at an agency or a studio at some point in your career, no matter what, is very valuable. Moving from client to client, learning to speak with clients, learning to sell your work, is very valuable, even if you’re going to end up working at a startup. I still think there’s an important place for studios in this world, and always will be. The ability to analyze the problem and explain it to someone who’s not a designer, is really important. You really get that at a studio or an agency. It’s sad in a way that a lot of the kids want to go straight to work at Facebook. There’s nothing wrong with that, but I still think there’s an important place for studios in this world, and always will be. And I think every designer should give that a shot. AN: That’s a perfect note to sign off on and I couldn’t agree more. I look forward to seeing where things go. I appreciate your time, thanks so much. This interview has been edited from an audio conversation recorded in January 2016. 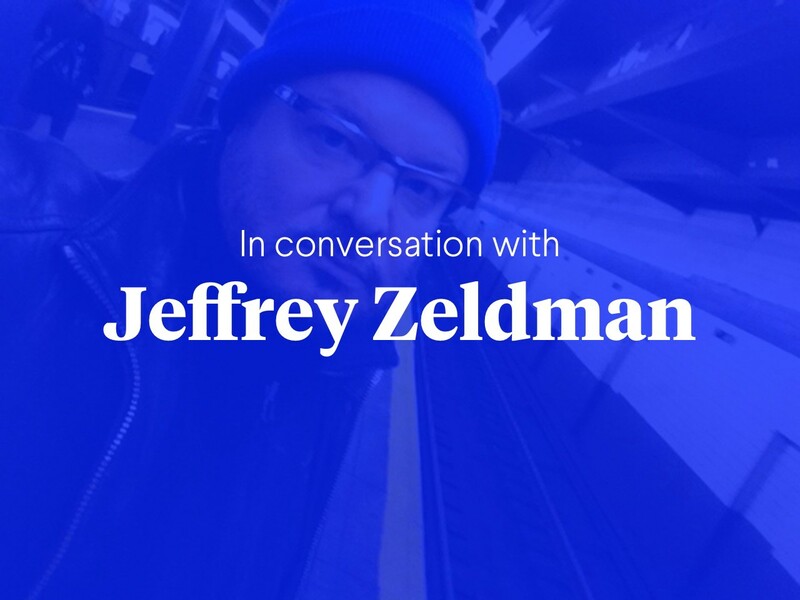 For more about Jeffrey Zeldman and his many projects, follow him on Twitter, and check out Happy Cog, An Event Apart, A List Apart, A Book Apart, and his podcast The Big Web Show.